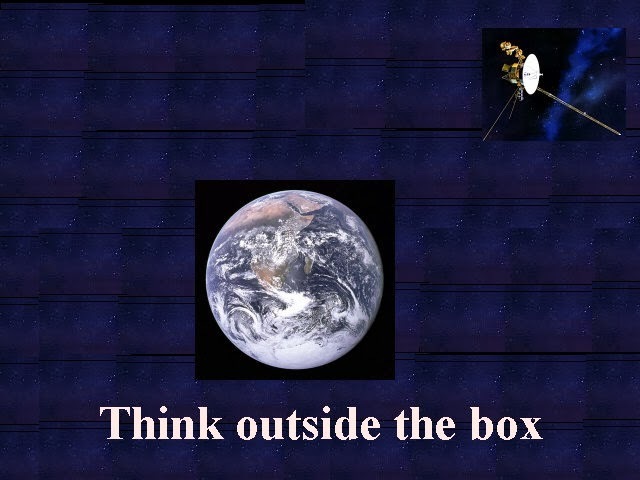 My attempt at a graphic depicts "think outside the box" implying the earth as the box. World Space Week is said to be kicked off October 4 on the anniversary of USSR's Sputnik launch in 1957. Pictured in my graphic is not Sputnik, but Voyager 1 spacecraft along with Earth. Humans need to think outside the box and expand our horizons beyond this limited earth. Exploration and scientific discovery is a good start. Maybe someday mining asteroids and more? Also, the images of Earth, that we have gotten from space, has given us a new perspective of our limited spaceship - Earth. As we keep expanding, we need to protect Earth. Maybe we need to learn how to stop growing? This seems unlikely, but we can learn how to achieve sustainability. Reducing population growth, the most important factor. We can use technology and miniaturization to cram more social sophistication into limited spaces, but eventually we will likely take more steps beyond Earth. Miniaturization can be done with changing culture and technology, but even doing this is inspired by looking at the "big picture," so to speak. Getting beyond small minded thinking. A big part of what inspires big picture thinking is the view of our entire earth from space.